We turn today to the letter "Q." Q is for Qui-Gon Jinn. For the most part, my Star Wars ABC's have kept to the original trilogy. Star Wars is one of the most influential movies ever made. Its sequels are equally influential. Its prequels are not as highly regarded (to say the least). However, I loved Liam Neeson's character in Episode I. He is Qui-Gon Jinn, a stately Jedi mentor with a rebellious streak. He does not always see eye-to-eye with the Jedi Council on many matters, yet serves the Republic to the best of his abilities. 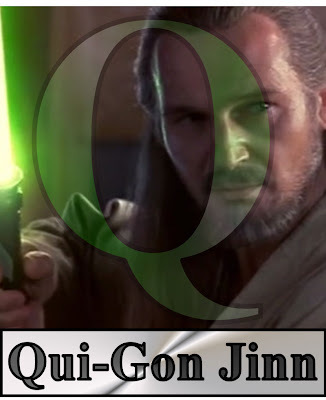 In my opinion, Qui-Gon is the single most important character in the prequel trilogy. Though he appears only in the first movie (he has a voice cameo from beyond in Episode II and gets mentioned in Episode III), he finds Anakin Skywalker, recognizes the boy's talents, and becomes determined to train Anakin regardless of the Jedi Council's apprehension. That's where his rebellious nature gets the best of him. Had he listened, it's entirely possible possible Darth Vader would never have come to pass. A better galaxy, you say? But then, whose children would've brought down the Empire? And, more importantly, who would've thrown the Emperor down the drain? TOMORROW: A fat man cries over its death because even the most loathsome creature has friends!